Is there anything better than an unexpected find?? How about one that is affordable and packs a nutritional punch too? This is just what I found recently when strolling through the food aisles searching for a few staples in my tiny local Wal-Mart. 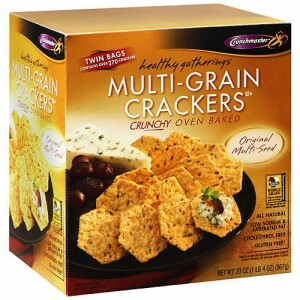 I am always willing to try a new cracker, especially when priced at just $2.48 a box. Of course, the box could always be bigger, but when shopping for new glute- free products $2.48 is a steal! There was the added allure of trying an all natural, sugar free, 100% whole grain product. A quick check of the ingredient list and I was sold with the discovery of sesame and flax seeds. Of course the true test was still to come. I pulled the crackers out at work for lunch and they were a hit! The crunch and sesame flavor were perfect. The serving size of 30 crackers (about the size of a quarter) for only 140 calories and 3 grams of protein was a selling point for my non-gluten-free coworkers too. Living a gluten-free lifestyle as a former carbaholic, trust me when I say finding a carb fix with nutritional value is a major score! Knowing this was a product I planned to continue buying, I visited their website at www.crunchmaster.com to find local retailers. I was pleasantly surprised to find a $1 off coupon, other product options and flavors, as well as club pack sizing on sale at wholesalers such as Sam’s Club and Costco. The packaging states that this product is Certified Gluten-Free by the Gluten-Free Certification Organization (GFCO). For those dealing with multiple allergies, this product does contain rice, sunflower, quinoa, flax seeds, and soy. Enjoy! Crunchmaster Multi-Grain Crisps get 5 SPOONS polished to shiny perfection! Stock up today! Too funny…I was eating those as I read this! They are pretty awesome, but addictive! My hubby found them at Sam’s Club too! $7 range for the equivalent of a little more than 4 of the single boxes. Great value! I get the garlic-flavored ones and put hummus and feta cheese on them. I found these at COSTCO. I love these crackers! Those crackers are the absolute best! I had originally found them at the Health Food Store to the tune of $4.95 so your Wal-Mart deal IS a deal! AND I’m online right now printing out a coupon as we speak! Thanks so much for the heads up! Thank you for the info. A coupon to boot! Awesome to get $1 off coupon. Can hardly wait to try these. There are 4 stores within 5 miles of me that carry these .